On Thursday, at the Cabrillo Beach Boathouse in San Pedro, the Environmental Protection Agency (EPA) gave out a national Environmental Justice Achievement Award to organizations that have worked to protect the public from eating locally caught DDT- and PCB-contaminated fish. This EPA award, given to only 5 projects nationwide, went to Boat People SOS Orange County, Cabrillo Marine Aquarium, California Department of Fish and Game, the City of Long Beach Bureau of Environmental Health, LA County Department of Public Health, Orange County Health Care Agency Environmental Health, St. Anselm’s Cross-Cultural Community Center, the Office of Environmental Health Hazard Assessment, Asian Youth Center, Herald Community Center, Steve Groner Associates, and Heal the Bay. Together, the groups in the Fish Contamination Education Collaborative have protected the health of fish consumers through education, enforcement, and risk assessment and communication. Culturally appropriate peer to peer education was a key to the program’s success. Heal the Bay’s contribution was the Pier Angler Outreach program, which has educated over 80,000 anglers in the past 8 years on the health risks of eating DDT- and PCB-contaminated fish. Cabrillo Marine Aquarium implemented a similar program at their local pier. 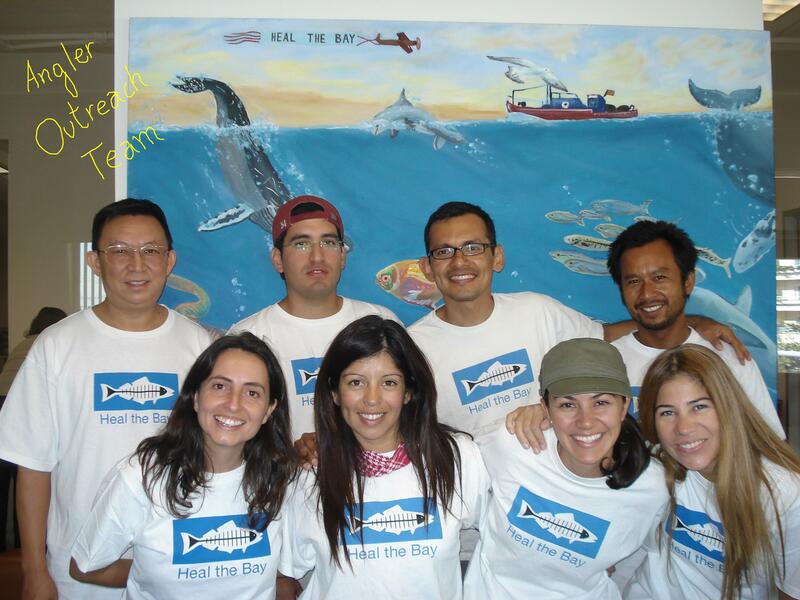 Heal the Bay’s program, led by James Alamillo and Frankie Orralla, provided the information in numerous languages and also taught anglers how to reduce health risks through smarter consumption and fish cooking and preparation techniques. In this case, hopefully, numerous cancer and birth defect cases were averted because of this successful risk communication effort. The awards were given by Keith Takata, Director of the EPA Region 9 Superfund program and Enrique Manzanilla, the Environmental Justice program Director. But the highlight of the award presentation was the passionate speech given by Tiffany Nguyen of Boat People SOS. She explained how the Vietnamese community participated in the outreach efforts and shared their gratitude to be a part of this health protection effort. The success of the program was due to collaboration and a unified belief that we needed to protect public health through education immediately rather than waiting for an engineering solution to the DDT and PCB contamination off of Palos Verdes. This outreach approach undoubtedly saved lives and definitely has led to more informed pier anglers and consumers of locally-caught fish in numerous Asian communities. Thank you to EPA for acknowledging the success of this program. Heal the Bay and our partners will continue this effort until there is no more health risk to the numerous communities that rely on locally-caught fish to feed their families.